My youngest son, Quintin, loves these little super hero guys. I would hate to even guess how many he has. He will sit and play with these guys for hours. Anytime he is going to spend the night at his grandma’s house or we are going on a trip, he insists on filling a bag with his little guys. Quintin has several backpacks and tote bags, but for some reason he loves to use ziplock bags. Don’t you just love them? There are millions of uses. Anyhow, he will proceed to stuff the little guys into the bag. He will continue to push more and more in, because he knows he is only allowed one zip bag of little guys. As he continues to stuff one little guy after another in the bag, I will mention that he needs to quit or the bag will break. However, he doesn’t want to leave those last few “favorites” at home, so he continues to stuff. 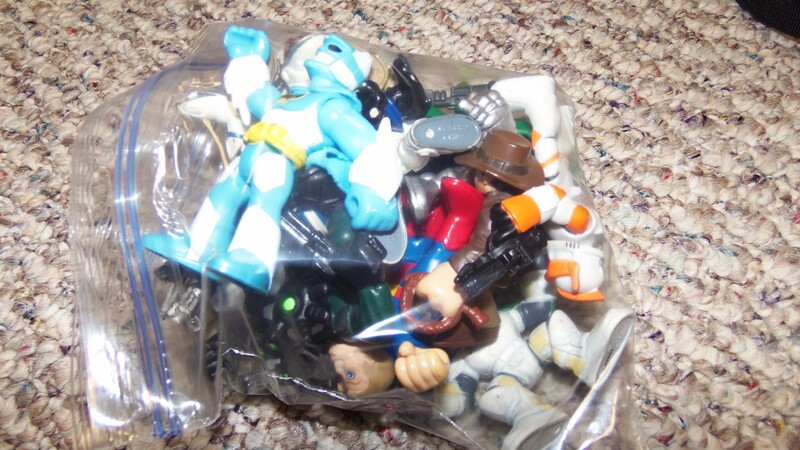 Inevitably, the bag breaks and little guys start spilling out. When you first read this story, you may think like I did, how could this child continue to stuff the little guys into the bag when he knew it would end up breaking and spilling out? But let me ask you a question, don’t many of us as adults do the very same thing in our own lives? We take those comments of others, the email messages that are unkind and the actions of others that hurt and simply stuff them down deep instead of dealing with the issue. I know because I tend to do the very thing in my own life. I want to keep the peace and avoid conflict, so I will stuff the hurt down and keep stuffing until I cannot hold it anymore. At this point, just like the ziplock bag, I fall apart at the seams and that “stuff” starts spilling out. For those of you who can identify with this, let me give you some hope and encouragement today. God is waiting and willing to take that “stuff” from us, all we need to do is cast it at His feet; “Give all your worries and cares to God, for he cares about you” (1 Peter 5:7, NLT). You and I do not need to carry those burdens and hurts anymore or stuff them down, just to keep the peace. We need to give it all to God. He loves you dear friend and wants to keep you from falling apart at the seams. I challenge you to take a moment right now and take all your cares and concerns that you have been stuffing and lay them at His feet. God will take care of them and grant you true peace. over from the blog hop! Thanks for sharing your story! Oh, I love this visual Jamy! The many lessons we can learn from our kids. It seems the Lord uses them to mold me and teach me on a daily basis. It is so comforting to know that we can even lay our ‘stuffing stuff’ at His feet and be released. I have been working on that for a while. I am a teacher and God uses my first graders to teach me daily as well. Thanks for your blog and the reminder that instead of stuffing we can put it at the Master’s feet. Also over from the Blog hop, though I don’t have kids I can certainly relate and the pictures you provide in both word and image makes the message loud and clear. Thanks for this. Thank you for the post. I was beginning to think there weren’t any stuffers out there. haha. I am a huge stuffer and I loved the story about your son and his super heros. I like you will do any thing to avoid conflict so I stuff, stuff, stuff and stuff some more. Usually if I have to stuff enough in a particular relationship I end up trying and put up barriers to protect myself from the hurt of the relationship, so I won’t be hurt any more. Thanks for reminding me to put “it” all at His feet.